Brief Description of Subject: One of nine exits from the Shrine of the Penitent. According to his own testimony, Paul violently persecuted followers of Jesus before his conversion to Christianity. According to the Acts of the Apostles, his conversion took place in a life-changing experience on the road to Damascus, where he experienced a vision of the resurrected Jesus after which he was temporarily blinded. Together with Simon Peter and James the Just, he is among the most notable of early Christian missionaries. Paul’s belief in Jesus as the Christ dramatically changed the course of his life. He wrote most of the New Testament Epistles and is referred to as the Apostle to the Gentiles. 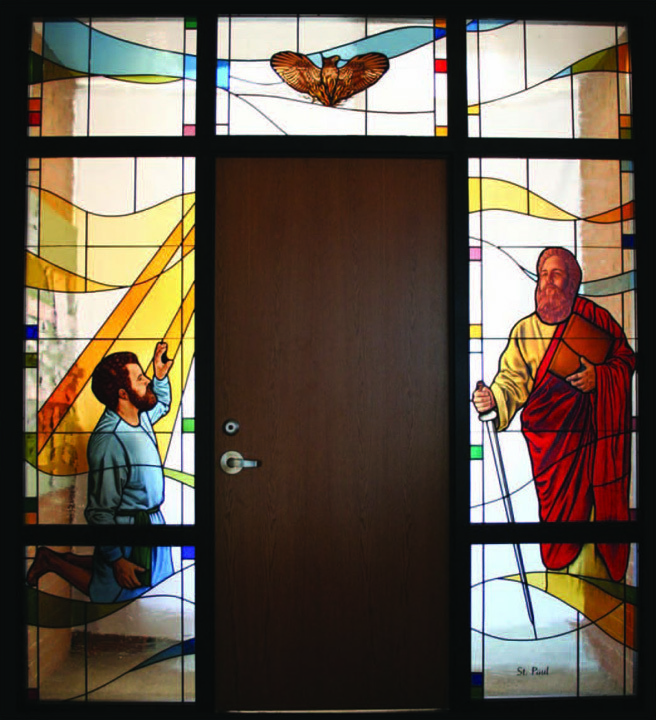 These windows were designed and painted by Michigan artist and longtime church member Maria Orr and were fabricated at the Pristine Glass Company in Grand Rapids, where she was employed. Pristine Glass employees Elizabeth Kolenda and her staff were much involved in the fabrication process by creating and cutting all the digital layouts for the window designs.